I’ve been writing my personal blog for two months now and this is blog post number 11. Although I’m only 11 posts in, I must admit it can be pretty tough maintaining a blog. However, the following 10 hacks have really helped me so far and will only be improved as I continue to post. I’m currently sat in my favourite local bar just a stone’s throw away from my flat. Whenever I want to get into the zone and write some content, I have to leave my office. Whether I’m at the Lovecars office or my own office, I have to escape that “office” environment. Not only is this something I like to do with a beer in hand, but it also helps me escape the telephone, Skype calls, and staff who may need my attention, which brings me onto the next point. As the above states, whenever I write a blog post, I leave my phone, computer and anything else that may distract me in the other room and on silent. Yes, I may take a break from writing (which is a good thing) and go and check my emails and Skype messages, but shutting everything off and just focusing on the computer is something I have to do. I’m a person who doesn’t concentrate well when I have distractions; hence, why I was never any good at school. Eliminate the distractions and focus on the task in hand. 3. Write about real things. This post, for example, is a summary of what I’ve learnt over the past two months writing on my blog. The second you start to dream up topics of how you made millions, created the next Facebook, or travelled to the moon is the second writing becomes hard (unless you’re a fictional writer). Stick to real life matters. If you’ve made money in any way, write about it. If something affected your business for the good or bad, write about it. Stick to what you know and what’s real, and things should flow a lot easier. Again, I’m sat here writing this on a Friday afternoon which seems to fit my schedule. 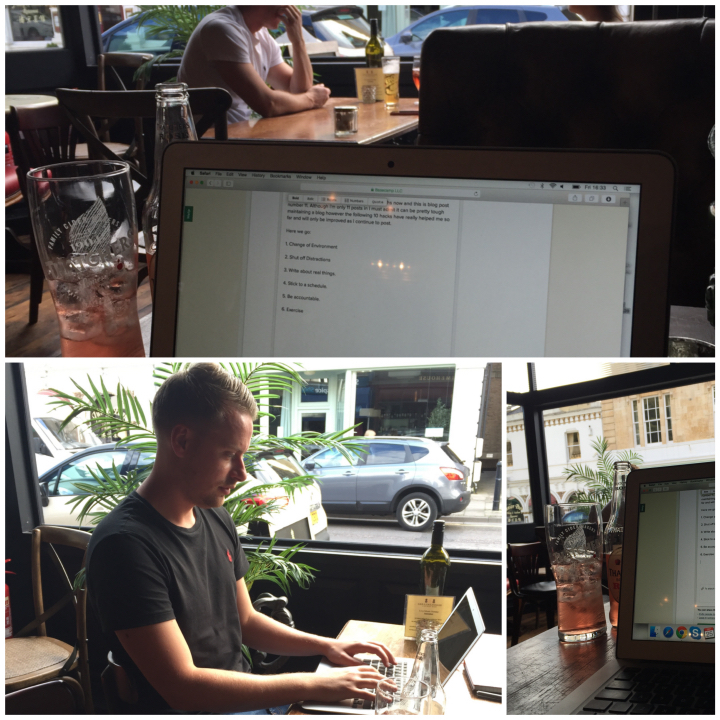 As I mentioned, I enjoy having a beer in hand at the end of the week and writing a blog post. This is my allotted time each week in which I have an hour or so to write some content. Every week I’m strict with my schedule and myself. I could easily be on the golf course or clocking off for the weekend, but I make sure I’m here and writing my posts! If you know where you’re meant to be and what you’re meant to be doing each week, it’s normally easier to get things done! If you’ve read one of my Growth Reports, you will know I lay most things on the table for all to see. This isn’t done to “show off” or to say “look at me”, but it’s done more to make myself accountable for what I put out there to the public. If I openly say I’m going to try and do at least one blog post a week, then that’s what I have to openly try to achieve. I’ve already stated that I want to publish at least 4 posts a month, and so far, just through being accountable, I’m able to stick to my targets. Often you can gain writer’s block when it comes to writing your own blog or publication. The number one tip I can offer to help re-energise is to exercise. In my recent blog post, I wrote about how I now like to run every day, and one of the main gains I receive from that is NOT to get fit in body but to get fit in mind. I dream up all manner of concepts and ideas about what to write on my blog when I’m out on my afternoon run. Get a pair of running shoes and go explore your mind and body! 8. Have posts on the go. Another hack I learned from listening to my friend Zac Johnson’s ROTE podcast is a blog post hack that’s helped me a lot. Zac was interviewing a seasoned blogger who advised having several articles on the go at once. Meaning, you create multiple drafts within your CRM or blog admin section, and you switch between posts as and when you feel like it. You may be working on several posts at once, which keeps things exciting and helps you get multiple articles done as and when you feel in the mood to write! 9. Take LOTS of Images. One thing that’s really excited me and helped me with my blog is imagery. I want to look back on this blog in 10 years and be able to almost read the posts as a story of my life. Images are VERY important and I now force myself to get into the habit of taking pictures of everything I do. Therefore, if I’m ever stuck for a topic OR wanting to remember what I did in the past month for my growth report, I simply open my iPhone and go through the recent pictures. This has triggered many good ideas and blog posts that I’m currently working on, and I can’t wait to look back on these in years to come! I’ve personally interacted and thanked every single person who’s commented, shared, liked, or sent me a message about my blog. It can be a VERY lonely world out there sat on your computer, but those little comments and messages really help to encourage you to continue in what you’re doing. Make sure your blog has comments switched on, and be sure to interact with others for morale! If you have any tips or hacks about keeping a blog active then comment below now!